How to find the area of a polygon? This area of a polygon calculator can help - as you can guess - in determining the area of a regular polygon. Type the number of sides and the polygon area appears in no time. If you're wondering how to find the area of a polygon formula, keep reading and you'll find the answer! If you want to calculate the area of any 3-sided or 4-sided polygon, check out this triangle area and quadrilateral area calculator. Determine the polygon area given side lengths and some diagonals, by splitting the polygon into triangles. Then find the area with given three sides (SSS) equation (it's called Heron's formula). Calculate the area of polygons using other formulas - e.g. for a scalene triangle or a quadrilateral. Let's assume that you want to calculate the area of a specific regular polygon, e.g. 12-sided polygon, dodecagon with 5-inch sides. Enter the number of sides of chosen polygon. Put 12 into the number of sides box. Type in the polygon side length. In our example, it's equal to 5 in. 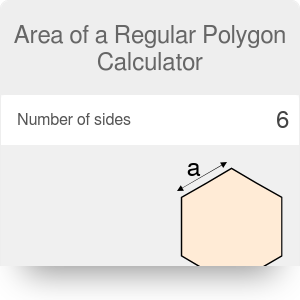 Our area of polygon calculator displays the area. It's 279.9 in². If you want to calculate the area of a regular polygon using other parameters than the side length, check out this general regular polygon calculator. Area of a Polygon Calculator can be embedded on your website to enrich the content you wrote and make it easier for your visitors to understand your message.